The seasons are changing, which means summer tans are wearing off and it's time to switch makeup bases. 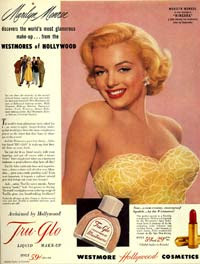 I wish I could have, "The world's most glamorous make-up, magical Tru-Glo gives you breath-taking loveliness!" These ad guys were geniuses (click on pick to see the full spiel). I need recommendations for a new makeup base to try. I don't use make up base, but if I did, I would feel comfortable with anything from Estee Lauder or MAC. haha i dont use make up bases too! honestly! not even foundation or whtever. but i know bobbi brown haf got some fab stuff! or try benefit! Do you mean foundation? (gets confusing these days with various primers etc). If you do, my fave is Vincent Longo WaterCanvas. I found it looked like i wore no makeup yet it covered well. I would get told things like 'I like girls who look pretty when they're not wearing makeup, like you!' I used a small foundation brush and applied it only where i needed it (as Bobbi Brown happens to suggest) which was my t-zone. Didn't need to powder over. Used primer or moisturiser under to prevent dryness being highlighted. It lasted for ages. I am depressed because they stopped stocking it in Australia and i threw out my empty container so don't even know which colour i am so can't even mail order it. I've found nothing as good since - but don't know if you will feel the same as it depends on your skin and preferences. If going out dancing, however, (especially if you have serious blemishes to cover), a Revlon Colourstay foundation is a must as any normal foundation sweats off on the dancefloor, leaving awful salty streaks. I don't know which Colourstay products are good right now as they change formulations from time to time. Paula Begoun's book 'Don't Go to the Cosmetics Counter Without Me' is v. helpful; she also has a website. Makeup Alley consumer reviews are also good. Good luck! Me again - I meant the Watercanvas in a compact, not the liquid one (though that may be good too!). K - Thanks, I've never tried the Watercanvas, I'll give it a shot!